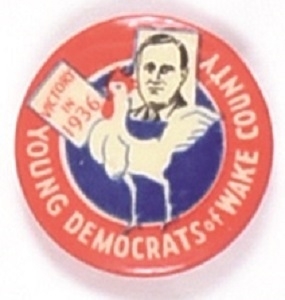 The Democratic rooster from Wake County, North Carolina, crows for Franklin Roosevelt on this scarce 1936 campaign pin. This is the county that the state capital, Raleigh is located. It’s a 1 inch celluloid with St. Louis Button Co. back paper, excellent condition. Previous sales this pin has brought from $637 to $935.